October 29 is National Cat Day, which means it’s the perfect moment to reflect on one of the most important memes in YouTube’s canon. 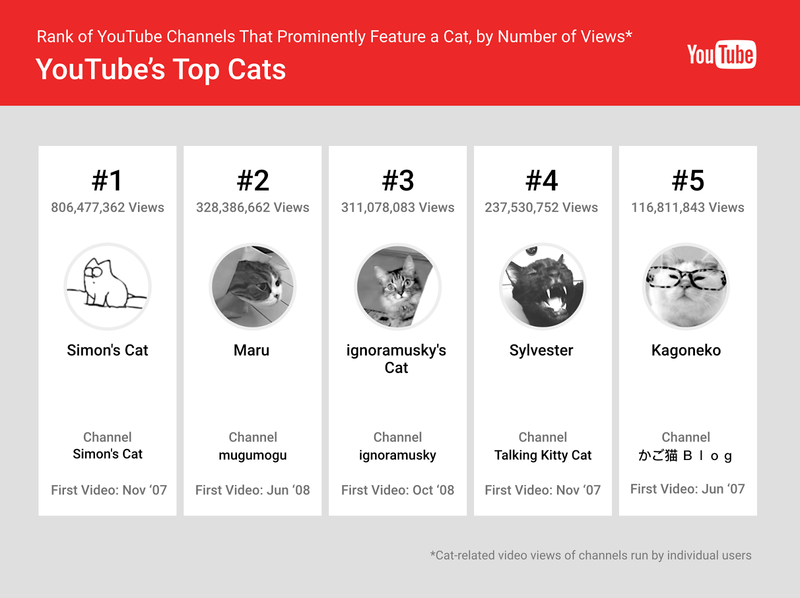 Who are the most popular cats on YouTube? Have YouTube viewers tired of watching cute kittens? Are cats more popular than dogs? We’ve crunched the numbers to deliver answers to these momentous questions. Have we achieved peak cat? Fans of felines can rest easy: according to figures dating back to 2007, cats are as popular as ever. To no surprise of YouTube’s cat enthusiasts, the most popular channel, by cat-related video views, is dedicated to Simon’s Cat. For years, creator Simon Tofield has illustrated a web series about his cat, inspired, in large part, by the real-life version of Simon’s cat, named Hugh. At the time of writing, the channel has amassed over 4 million subscribers. There are few rivalries that can match that of cats vs. dogs. 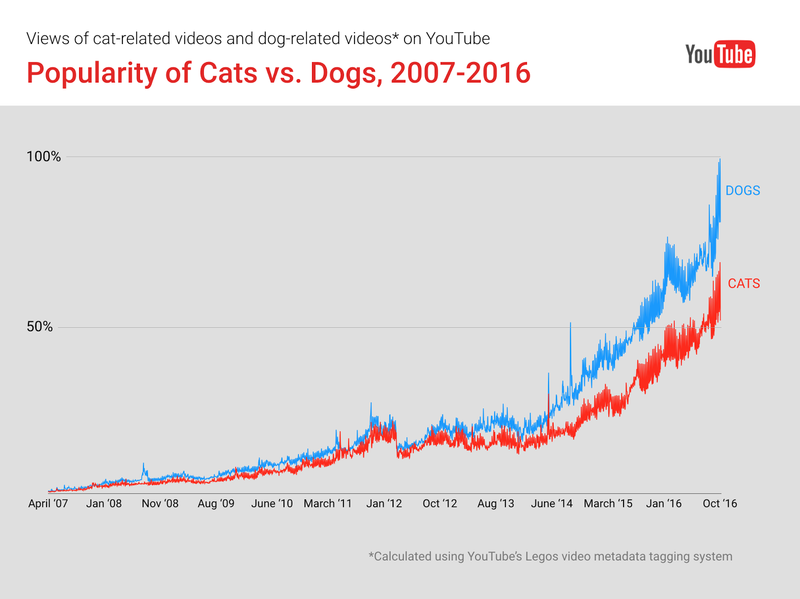 And, despite the popular belief that YouTube is only an archive of cat videos, dogs seem to be the more popular of the two on YouTube. Views over the past two years seem to suggest that this trend is going to continue. As YouTube continues to grow as a destination for filmmakers, chefs, and educators, there is a simple joy that cat videos still provide in 2016. Over the past 11 years, YouTube has given us the chance to melt over friendships like Oskar the blind cat and Klaus, develop existential crises from Henri’s life musings, and celebrate the personality of the late Colonel Meow, the 2014 Guinness World Record holder for the cat with the longest fur. 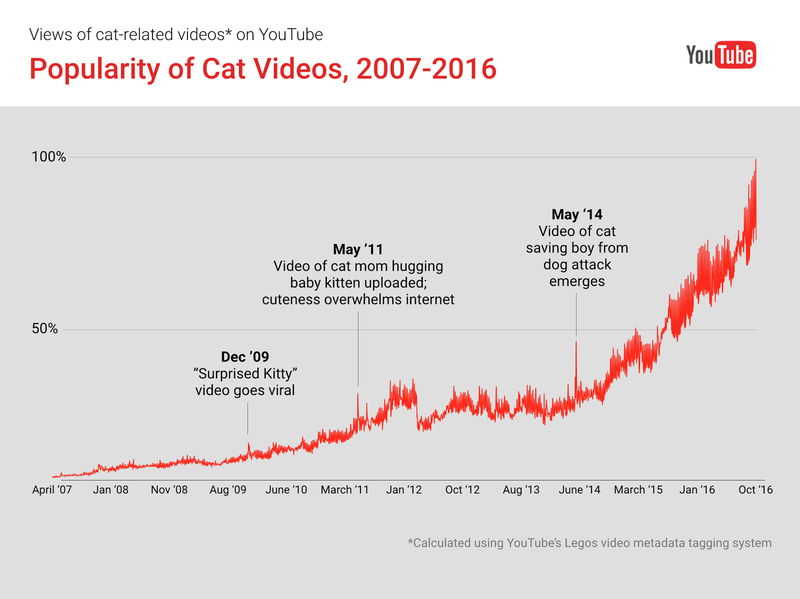 Though the future may soon be dog driven, both YouTube’s founding fathers — Grumpy Cat, Keyboard Cat, and Lil Bub — and their digital legacy will remain very much feline.